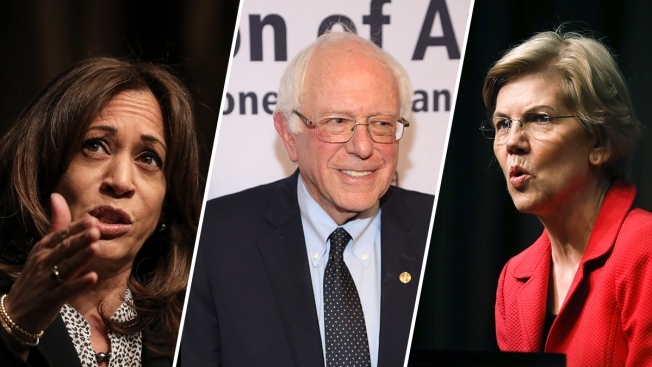 Democratic presidential candidates on Friday touted their plans on criminal justice reform, the study of reparations and other racial equality issues, highlighting the critical role black voters will play in choosing the party's 2020 nominee. Speaking at the National Action Network's conference in New York, California Sen. Kamala Harris pledged to double the size of the Justice Department's civil rights division and to sign legislation creating a commission to study reparations to African Americans hurt by slavery. Vermont Sen. Bernie Sanders also said he would sign that reparations bill, even as he emphasized the importance of a broader anti-poverty policy. "We know that they are using the Department of Justice in a way that is about politics and not about pursuit of equality," Harris, one of two black leading candidates for the party's nomination, told the receptive audience. Earlier on Friday, she told a radio interviewer she would be open to choosing a woman as her running mate if she wins the nomination to take on President Donald Trump. Sanders, who fell short in his 2016 presidential bid but is a front-runner in 2020, elated the crowd by jabbing at Trump as "a racist, sexist, a homophobe, a xenophobe and a religious bigot." He had previously questioned the lack of specifics in the reparations debate, calling for a detailed focus on economic recovery for low-income African American communities. But Sanders said Friday he would "of course" sign a study bill on the issue, aligning himself with six other Democratic candidates who spoke at the group's annual conference this week. One of those candidates, Massachusetts Sen. Elizabeth Warren, used her speech to escalate her call for Democrats to end the 60-vote requirement for many major bills to clear the Senate if her party wins the White House and Republicans try to block their agenda. Warren outlined the history of the Senate filibuster's use "as a tool to block progress on racial justice," adding that Democrats should "be bold and clear" if they take back the presidency. Invoking Republican obstruction of former President Barack Obama's agenda, Warren said if Republicans place "small-minded partisanship ahead of solving the massive problems facing this country, then we should get rid of the filibuster." New Jersey Sen. Cory Booker roused the crowd by making the case for his plan to give every American child a savings account, with extra contributions for those from low-income families, as a means to close the nation's racial wealth gap. Former Colorado Gov. John Hickenlooper used his speech to outline his record on policing, suggesting that the nation "shutter some prisons altogether." Other White House hopefuls also spoke at the conference to spotlight their records on remedying economic and social inequities that have impeded African American communities. Sens. Kirsten Gillibrand of New York and Amy Klobuchar of Minnesota, and Ohio Rep. Tim Ryan were among those who addressed the group on Friday. Former Texas Rep. Beto O'Rourke and Pete Buttigieg, mayor of South Bend, Indiana, spoke earlier in the week. The Rev. Al Sharpton, who founded the group, told attendees on Friday that the day was about "mainstreaming the racial divide in America" as well as "changing the conversation, so we're all included." Derick Bowers, 34, a New York City native who works on criminal justice issues, likened the day's packed lineup of presidential hopefuls to "The Bachelor," the popular reality TV dating competition where suitors compete to win a rose. Joking aside, Bowers said that although he's partial to Harris — citing their shared graduation from a historically black college or university — there are "so many really good candidates" in the running. "I think at the end of it we're going to have a really good Democratic nominee," Bowers said. Associated Press writer Errin Haines Whack contributed.